I always believed that my Grandma was a bit on the eccentric side. She wore some interesting outfits, various wigs and some funky jewelry. 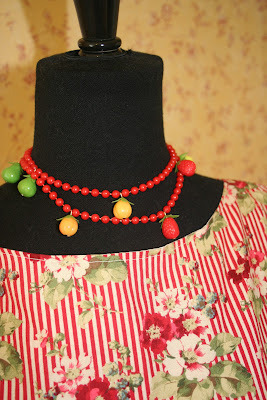 My college roomie, and bestest bud Amy, got a big kick out of this fruit necklace she wore, as did I. Limes, lemons, strawberries and oranges interspersed with red beads - all in plastic. Grandma passed away when I was in college and two of these necklaces were found with her jewelry. I promptly passed one on to Amy. When I was swapping out frocks on my dress form today I remembered I still had the necklace. 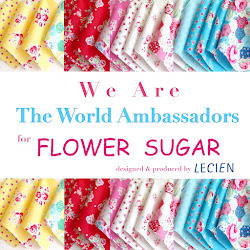 It goes well with the homemade cotton dress, don't you agree? 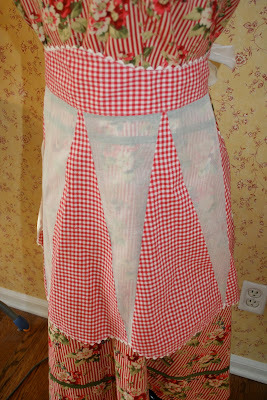 I love this apron I so generously recieved in an apron swap a couple of months ago. I would dress like this every day if I could. Blessings! I love the necklace! Love the dress and apron! Where do you have your dress form? Enjoyed this post! What a wonderful reminder of your grandmother and her quirky sense of style! Everyone needs a family member like that, I think. Very cute. The outfit just looks like fun. What a great combination. The necklace is perfect with the dress as is the apron. I have a tropical fruit necklace from the 80's along with a lot of other necklaces that I look at and think "What was I thinking?". But my granddaughters love them, especially the fruit one. So hang on to your Grandma's. Someday you will have a granddaughter that will think it is so cool. I always thought that I missed my era. I should have been around with June Cleaver and the rest of them. 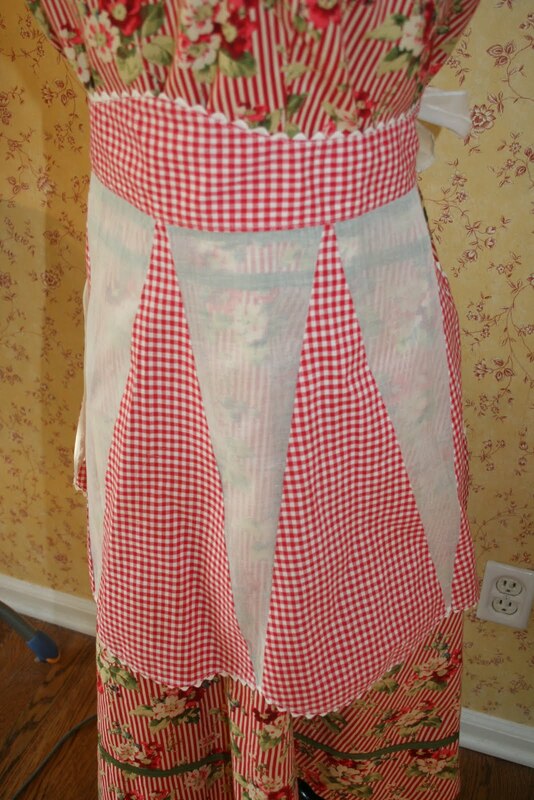 I love these dresses, aprons and jewelry too. When I was in 7th grade I had a big ole' pair of cork wedge heel sandals with clear plastic on top and bright colored fruit on top of that. My brother in law made so much fun of me and called me Carmen Miranda. I just had to laugh when I saw Jenny post that. I remember well the days when ladies did not wear pants, they only wore dresses. My Grama milked cows, did her chores and did field work in dresses. She did not have any covering on her legs but nylon stockings. 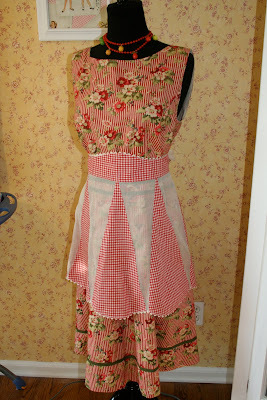 It was so much fun to see the funky necklace, the dress and the awesome apron. Thanks for sharing!